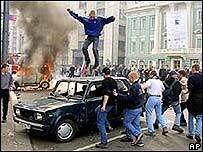 The first time people outside Russia became aware of Russian hooligans was in 2002, when fans rioted in Moscow, burning cars and fighting police after the national team lost to Japan in the World Cup. Police have struggled to contain the growth of hooliganism. 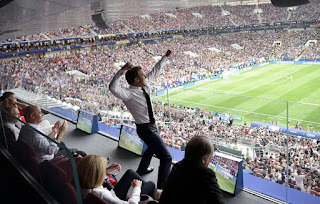 Names like the TsSKA firm, and the Red and Blue Warriors emulate the English bad boy supporters and are very well organised boasting of consultation with established groups and hooligan consultants. Organised happy slapping became a major feature of the new order. To avoid authorities, gangs agreed before matches by phone to where they would meet and fight. Rumbles were regularly filmed for later analysis. Engagements usually take place without weaponry and firms were banned carrying weapons or from wearing bovver boots after reports of serious injuries. The soker kezhuali fashion advice from casual fashionista, suggests the conventional Aquascutum, and Fred Perry gear was replaced with Stone Island, Lacoste and Dima and 21. Authentic gear is vital with real casuals avoiding fake brands as bling and chavs are considered uncool.